Burj Khalifa, Dubai, welcomes the New Year 2019 with spectacular fireworks and laser show. The tallest building in the world becomes key attraction on the eve of the new year . The skyscraper, like in the past years, is going to have an amazing LED light show. The iconic tower’s official Twitter handle tweeted a teaser of what the final countdown is going to look like and it seems there is a lot in store. The building currently adorned in varying colours has a great show to look forward to. For people ringing in 2019 in Dubai, it is going to be a star attraction. People from around the world visit Dubai to witness these rare fireworks and a laser show. At the Downtown Dubai, as many as 1.5 million visitors are expected, leading authorities to issue a cautionary message on what pathways should be taken for bachelors and families. 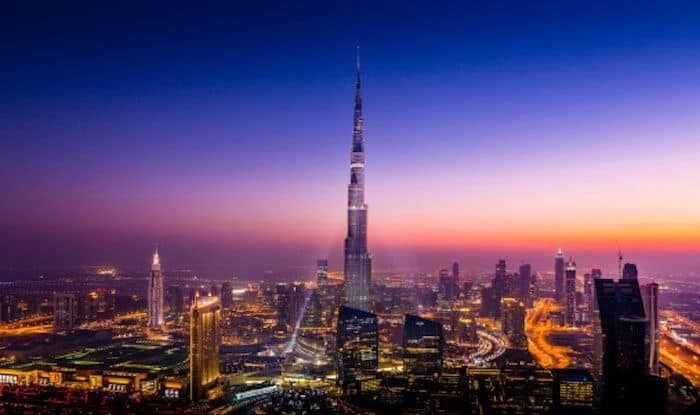 The video also illustrated the various locations, with the Burj Khalifa Island Park, and the South Ridge reserved for families while the Burj Views dedicated for bachelors. Families and customers at restaurants can watch the Light Show from Dubai Boulevard, Burj Plaza and Souk Al Bahar. The show is choreographed to the music by UAE’s Dhabiwood Studios with more than 80 musicians. The musical composition was recorded in studios in Dubai and Cairo. Earlier this month, Emaar Properties which are handling the affair had unveiled a ‘behind-the-scenes’ video of the preparations. The light show will also show the UAE’s achievements and pay tribute to the founding father of the nation, the late Sheikh Zayed bin Sultan Al Nahyan and thus mark the ‘Year of Zayed’ in 2018.